If you've followed baseball for any length of time of 20-30 years or more, you'll remember a lot of Houston Astro history. 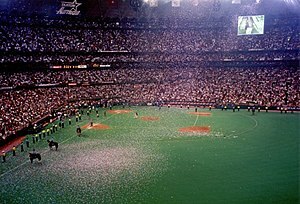 From the time that the Houston Astros played in the famous Astrodome, which opened in 1965 and was the first of it's kind anywhere, to tonight when the Phillies are playing the Astros at home in Philadelphia, there is a rich history between the two teams. In 2013, the Houston Astros will move from the National League to the American League and the long running history of this National League team will have ended with the end of the 2012 season. In fact this is the last trip the Astros are making to Philadelphia as a National League team, pending any rainouts of course. The Phillies will make one more road trip to Houston in for a 4 game series in September (13th-16th), and that will be it. The Astros will now become like a lot of other American League teams that we hardly see or if you are a real National League fan, care to even follow everyday. Yes, almost like a team that we have known very well has been just erased and is starting over. Kind of sad for the Astros, but I wonder what it is like to be a fan of the team? Are you happy they are leaving the NL for the AL or not? Even the Astros longtime broadcaster Milo Hamilton (Hall of Fame inductee) is giving up his job as broadcast announcer at the end of the season, so this is another reason that the Astros just won't be the same. Milo won't completely disappear from Astro landscape as he will be in the background doing special assignments and the like, but his familiar voice will be gone from broadcasts. Read more about Milo's departure here. This post could go on and on about the goofy Astro uniforms that they used to wear, the great years with J.R. Richard on the mound and the names like Joe Niekro, and Jose Cruz. Even the most recent association the Phillies had with the Astros with their connection to Ed Wade who was a GM of the Astros until recently. The memories go on and on. No, I just think it's fitting that we just say goodbye, and good luck to what lies ahead for his team. As for changes itself to Major League Baseball, that is coming down the road too. The move that the Astros make will open the door for a lot more inter-league play between the National and American League teams. Like it or not, it's what the future of baseball is starting to look like according to Bud Selig, the commissioner of baseball. Not only that, but adding teams to the playoffs as well, so what we've known for many years will be changing as the MLB yet makes another move for more revenue via the playoffs. Will it work or will it drive some fans away? Stay tuned.